Do you get too much email? You know the scenario. Your inbox is overflowing with unanswered emails, newsletters and other stuff you just don’t get time to read or reply to. Install this FREE plugin for Microsoft Outlook to prevent the daily barrage of time wasting and distracting email during and out of work hours. OkInbox delays any non-urgent and unimportant email, bundles these emails in to a digest and delivers them as a single email newsletter at a later time and date more convenient to you. WHEN YOU USE OKINBOX, THE BENEFITS BECOME OBVIOUS. 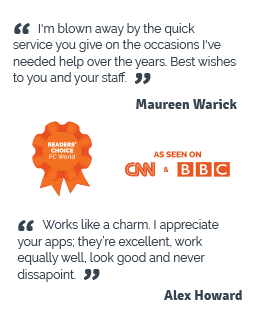 Integrated with Microsoft Outlook, OkInbox is very simple to use and you’ll quickly notice the benefits of a reduced amount of email arriving to your inbox.. Regain your productivity by avoiding unnecessary interruptions. Only receive the email you want, when you want, without getting distracted by non-urgent, unimportant emails and notifications. With OkInbox, it’s dead easy to organize your inbox and delay unimportant email to be delivered at a more convenient time, with a single click of the ‘Add to Digest’ button. Unimportant and non-urgent emails are delayed, embedded into a digest, then delivered at a pre-determined time/date, eg. Lunch time each day or say 4:30pm. Important email is always delivered normally without delay. A digest is like a newsletter which summarizes all the delayed email. It displays the subject lines for each email so you can quickly check at a glance the content of each email, then click to go straight to it. The digest also includes each email as an attachment. Instead of getting bombarded by emails at all hours of the day, OkInbox lets you delay emails from certain senders or based on criteria, then creates a digest (summary) of these emails and delivers this digest at a time set by you. This way you’re not interrupted by the constant influx of new and distracting email or overloaded with unimportant email all the time. When an email arrives in to your inbox which is not important, you click the ‘Add to Digest’ button and select which digest you want to add the email to. The next time an email from that sender arrives, OkInbox delays it from being delivered. After a set period of time, all the delayed emails are added to a digest and delivered as a single email. What versions of Microsoft Outlook does OkInbox work with? Outlook 2003, 2007, 2010 and 2013 (32 and 64 bit versions), including Microsoft Exchange and Office 365 when used with a local version of Outlook. An email digest is a single email which summarizes any emails which have arrived during a period of time. Each email is summarized in the body to allow you to quickly read the content, and the original emails are added as attachments. How can I add emails to a digest? Click on the Add to Digest button on the Outlook toolbar and you will be shown the digests to select. 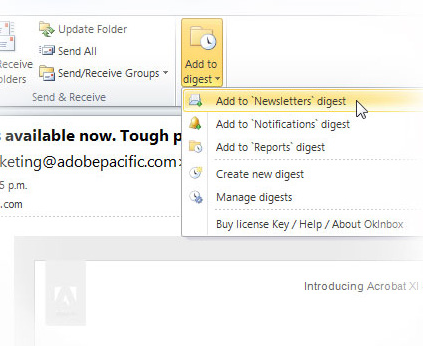 Alternatively, right click on an email and select Add to Digest and select the digest (Not Outlook 2003). How do I uninstall OkInbox? Go to Start>>Program Files>>Firetrust>>OkInbox>>Uninstall How do I install OkInbox? Double click on the OkInbox.exe installer icon, and installation will proceed from there. If there are any other prerequisite software packages needed, the installer will automatically install these. Are there any prerequisities to installing OkInbox? Yes, the installer will install the necessary additional files for you. These are Microsoft Interop Assemblies and Visual Studio Tools for Office. Which version of Microsoft Outlook do I have? The installer will work out which version you have and install the correct version for you. How do I create a new digest? By default, two empty digests with the names Notifications and Newsletters are added by default. But you can create your own. Click on the Add to Digest button on the Outlook toolbar, select Create new Digest. A window will open. Enter the digest name and choose a time period for when the digests will be delivered. Next click Add Rules button and add some rules to how your emails will be digested, or alternatively just wait until emails come in to your inbox and click the Add to Digest button. This will add the senders email address to the rules. Can I view video tutorials? Yes, please see the videos on our Firetrust Youtube page here and here. How can I move my email from a digest back to the inbox? Sometimes you may want to reply or forward an email which is inside a digest. Just locate the email as an attachment from in the digest, then drag it and drop it in to your inbox. How do I add emails to a digest? How can I add/delete a digest? Click on the Add to Digest button on the Outlook toolbar, select Manage Digests, select the digest and click the Edit Delivery button. Choose from the options to deliver the digest, either by the hour or at a set time(s) of the day. How can I release an unreleased digest? Sometimes you may want to access a digest before it's due. Click on the Add to Digest button on the Outlook toolbar, select Manage Digests, select the digest and click the Release Digest button. Can I view statistics for how much time I have saved? Click on the Add to Digest button on the Outlook toolbar, select Buy License key/Help/About OkInbox and then click the Statistics button. Statistics are based on saving 3 minutes per digested email given the amount of distraction and task switching involved. How can I setup custom rules for my digests? Click on the Add to Digest button on the Outlook toolbar, select Manage Digests, select the digest and click the Edit Rules button. You can Add Rules so that an email is added to a digest when certain criteria is met, ie the subject contains a certain word. You can also have an exception to this rule, so that if this word appears, but it's from a friend then don't put the email in the digest. The filter rules are quite flexible and allow you to add Operators such as 'Contains', 'Starts With', 'Ends With', 'is Like', 'Is', and Relations such as AND, OR, NOT. Start by clicking the Add button next to the top window. This is the rule for when you want to add an email to a digest. A window will appear and ask you to create a rule. For example, choose Criteria:Subject Operator:Is Value:test. So any email with the subject line test will be added to the digest. Note: if you wanted to digest an email where the subject contains the word test (plus other words), then you would change it to Criteria:Subject Operator:Contains Value:test. If you want to make an exception to this rule, Click the Add button in the bottom window. A window will appear and ask you to create a rule. For example, choose Criteria:Importance Operator:Is Value: High. So, now we have a rule set which says, digest any email with test in the subject, except when the importance is high. We could get more complicated with adding extra Conditions to rules. So, this would read as: Digest emails if the subject contains the word Bingo, but not if the body contains hotmail.com or hotmail.co.uk etc. The Like filter is useful as it allows you to substitute Wildcards in place of characters. The Asterisk (*) will replace any number of characters, and the question mark (?) will replace one character. How can I set the time to release a digest? Click on the Add to Digest button on the Outlook toolbar, select Manage Digests, select the digest and click the Edit Delivery button. Choose from the options to deliver the digest, either by the hour or at a set time(s) of the day. Another option allows you to avoid being disrupted after work hours by emails, but during work hours you'll receive your emails as you normally do. 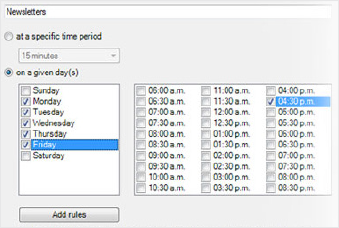 In this case, select the option to Deliver emails to inbox between these times, otherwise send to digest and choose the appropriate days and hours. How can I change the notifications? OkInbox disables Outlooks notifications and replicates these to be able to handle them better, so you don't get notifications for emails which are destined for a digest. In the Manage Digests>>Options, you can set the notification preferences there. You may need to restart Outlook to get these working. 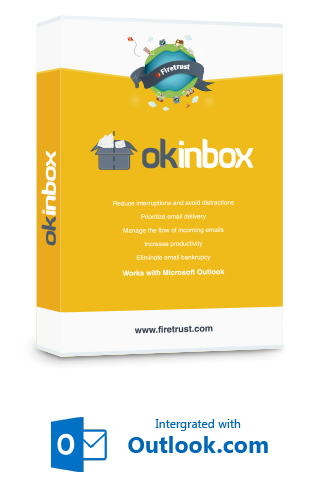 You can register for your version of Outlook at this page http://www.firetrust.com/en/products/okinbox-stops-email-overload/buy After purchase, you will be given a 12 digit license key. Go to Add to Digest>>Buy License Key/Help/About OkInbox, then enter the license key. Click Activate OkInbox. Where are all the settings files stored? Because IMAP accounts have to download the entire email when viewed, this creates some small delays in Outlook when they arrive in the inbox and are processed by OkInbox. • Turn off downloading of images inside email. • Go to File>>Work Offline. IMAP will be much faster because Outlook will not connect with the IMAP server before executing your command. At the moment we've disabled OkInbox working with Gmail and IMAP because of performance issues. This will also affect you if you use a custom domain with IMAP in Gmail. Outlook has always had spotty performance using Gmail with IMAP because it gets overloaded with requests. We are currently working on a solution to this and hope to have it completed soon. How can I update OkInbox? When you first start OkInbox, if there is an update available you will be prompted to update. From there, the update process is automatic and when you next restart Outlook, the new version of OkInbox will be installed. OkInbox will automatically check for updates every 2 days. Are there any statistics about how much email overload costs? Yes. The problem is bigger than spam! “In fact, research conducted…shows that the problem cost the U.S. economy around $997 billion in 2010.” - Jonathan Spira, 2011. Information Overload: None Are Immune. Information Management, 21(5), 32. “But one calculation by Nathan Zeldes and two other researchers put Intel’s annual cost of reduced efficiency, in the form of time lost to handling unnecessary e-mail and recovering from information interruptions, at nearly $1 billion.” - Paul Hemp. (2009). Death by information overload. Harvard Business Review, 87(9), 83–89. Harvard Business School Publication Corp.
“A study by Microsoft researchers tracking the e-mail habits of coworkers found that once their work had been interrupted by an e-mail notification, people took, on average, 24 minutes to return to the suspended task.” - Paul Hemp. (2009). Death by information overload. Harvard Business Review, 87(9), 83–89. Harvard Business School Publication Corp.
- Ayyagari, R., Grover, V., & Purvis, R. (2011). Technostress: Technological Antecedents and Implications. MIS Quarterly, 35(4), 831-858. A recent Intel study showed that it's not just the volume of email which causes email overload, but the constant distraction of new email and the habit of checking your inbox which prevents you getting on with your day. In this study, workers spent about 20 hours a week doing e-mail, and one-third of that e-mail is useless. Even worse, 70 percent of e-mail gets handled within six minutes of arrival and the average worker is interrupted every three minutes and thus they had to task switch constantly. The bottom line was that Intel's workers were wasting about six hours a week. How can I move OKInbox to a new computer? The OkInbox data files are in 'My Computer>>OkInbox'. Move this folder to your new computer. Download and install OkInbox for your version of Outlook and OkInbox will pick up your settings. Note: You will need to re-enter your license key. Note 2: Your OkInbox license key only works on the version of Outlook you purchased it for. eg. OkInbox for Outlook 2007 will not work on Outlook 2010. You would need to purchase a new key for OkInbox for Outlook 2010. How does OkInbox work with Outlook Rules? Outlook rules take precedence over OkInbox rules. Email overload means spending hours on email each day, while being constantly interrupted by more incoming email. It distracts you from doing real productive work. Research has shown that it's not just the volume of email which overwhelms people, but the constant interruptions and task switching which takes people away from other tasks. Non-urgent and unimportant email is delayed and embedded into a digest, which is like a newsletter with a summary of all the delayed email. This digest is then delivered at a pre-determined time/date, eg. Lunch time each day or say 4:30pm. Important email is delivered normally. Unimportant email doesn’t necessarily mean it’s not wanted, it could be notifications, newsletters, or email from colleagues which just doesn’t need your instant attention. When you use OkInbox, instead of receiving loads of email each morning and trying to hunt down the important email, you could end up with just a few important emails to action, and a digest of the less important emails sent to you at lunch time to browse. Using OkInbox is easy. After you’ve installed it, when unimportant email comes in, just add it to a pre-set digest (eg. Newsletters). The next time a newsletter from that organization arrives, it is instead added to the Newsletter Digest and delivered at a later time. As you add more unimportant email to the OkInbox, in a few days you’ll notice a huge reduction in the amount of email you receive. if you want to get more particular about what email is delayed, you can setup custom filters to automatically add emails to OkInbox based on Subject, From, Urgency, Text in the email body and so on. What happens after I install OkInbox? Outlook will first request to install the plugin, then you'll notice a new button 'Add to Digest' on the Outlook toolbar. 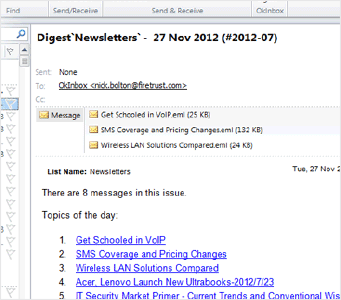 Click an email in your inbox you want to delay, and click the ‘Add to Digest’ button and choose which Digest to add to. Next, click the 'Add to Digest' button again and choose 'Manage Digests' and click the button 'Edit Delivery' and choose an appropriate time for the digest to be delivered. How is this different from creating rules? OkInbox does two things you can't do with Outlook rules. OkInbox will delay unimportant emails, and hide them until a certain time so you won't know they're there to interrupt your workflow. While rules are great for shuffling emails in to folders, research has shown most people don’t filter their emails into folders, but instead just let email build up in the inbox. If an email does come in which a rule sends it to a folder, users are still distracted in to reading that email. Rules are more like a filing mechanism, but do not stop the distraction. OkInbox delays unimportant emails and hides them, stops notifications of digested email and stops the distraction. Which versions of Microsoft Outlook does OkInbox work with? Outlook 2003, 2007, 2010, 2013 using POP3, IMAP or Microsoft Exchange. Updates will be delivered to support any future Outlook versions. How much does OkInbox cost? It's Free, although there are limits on the number of rules you can have. Purchasing a license removes that limit.